Paths of Connection, 9780997130102, 280pp. This is a groundbreaking book. Throughout his infancy and childhood, the author suffered severe physical and emotional abuse. He shares his personal journey and the disciplines, treatments and practices that enabled him to overcome the effects of severe maltreatment. He studied as a professional each of these disciplines and treatments that helped him as a patient. Along the way Dr. St John had some life altering insights, such as: -"Normal" is not nearly good enough. -We have all been wounded to some degree or other. -Most of can increase our ability to receive and absorb love. -We can enjoy more life-giving love connections. -We can improve our resilience, deal more effectively with stress, experience better health. -We can expand our sense of who we are. -Because our bodies are mostly water, we can heal the deepest wounds to our psyche and go beyond what we can even imagine. Water is highly adaptable And so are we To make such changes we must address ourselves as a whole, which means not only our psyches, our personalities, our belief structure, our relationship capacities, but the fluids, tissues, structure and movement of our bodies as well. We are whole organisms, not just bodies with a mind. 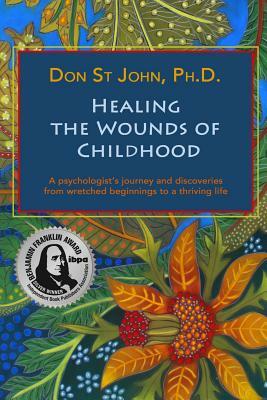 Healing the Wounds of Childhood tells the reader where to look if she wants to grow into her full potential for good health and beautiful intimate relationships. Most self-help books focus on one area such as the brain, or communication skills. Healing the Wounds of Childhood provides the big picture. This alone would make this a unique book. However, the book is sprinkled with autobiographical material, lending a very human story to this holistic presentation.